In this 5-minute guide to boiler’s with no hot water, we’ve split it down into sections, so you can flick straight to the section that sounds like your problem. We’ve also included a quick “fix” section with each, where possible. Before we carry on, if you want an engineer to look at the problem you can book one in here. Thinking about ditching your unreliable boiler, for a fresh one with a long warranty? You can get a Worcester Bosch installed DIRT cheap here. And, if you’re looking for a faults not listed here, checkout our guide to boiler problems. Of all the diagnosis’s, this is the hardest one to pin-point without inspecting the boiler. The possibilities are pretty much endless. Is your boiler control panel blank? Are the power lights off? We’ve created a guide specifically for users with no power to their boiler here. On each boiler, there is a “flow” (hot water out) and a “return” (water returning to the boiler, after going around the heating) pipe. Your flow pipe should be hot. The return pipe should be a little bit cooler; radiators and pipework will take some of the heat out of the water as it travels round the system. If neither the flow or return are hot/warm, there’s a chance the pump isn’t circulating. Need to diagnose a faulty pump? We’ve created a guide to central heating pump problems here. The pilot light is the small flame you see in your boiler. If this has gone out, it’s likely a fault code has appeared (check your owner’s manual to see what the fault code means). We can’t advise fixes on gas related issues. You should contact a Gas Safe engineer. You can speak to one here. If you have power, and can hear internal parts working/moving, there’s a good chance you’ve got a faulty PCB and display panel. Like other components in the boiler, they do break over time. This process can be sped up if your boiler is leaking water that’s made it’s way into the control panel. Due to the complexity of the boiler’s display panel, the best option is the replace it. The PCB is incredibly expensive. Expect a bill of around £500. If your boiler is over 5 years old or out of warranty, depending on the condition of other parts, it might be worth considering a replacement. Typical installation prices start from around £1,800+. However, we’d recommend checking out BOXT (part owned by Bosch). 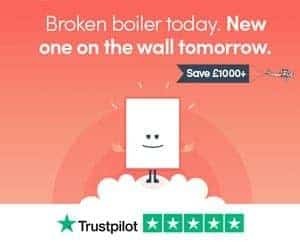 They’re one of the cheapest for Worcester boiler installations, and you can get your price online, in less than 2 minutes here. No hot water or heating could mean that you have a faulty timer or programmer. Check the owner’s manual for details on how to reset the programmer and timer. And, if you’ve had a power cut, this can mess with the time/date stamp on both devices. If you’ve programmed your heating and hot water, it could be set to the wrong time. Check time/date stamps and change if necessary. If you’re getting no hot water or heating on cold mornings, or during winter, there’s a good chance the condensate pipe is frozen. The condensate pipe vents flue gases from your property, and these are prone to freezing. Check the pipe for blockages/frozen debris. Clear the blockage and slowly thaw out the pipe. A boiler lockout is a shut-down procedure. It’s a shut-down sequence initiated by the boiler when it realises there’s something not quite right. There’s a tonne of reasons a boiler can lockout; some have been mentioned above. The display panel will show a fault code. With that information in hand, head over to our page on common boiler lockout causes and fixes here. Your boiler needs pressure in order to heat up hot water. If you have no hot water or central heating, it could be due to a loss of pressure. We’ve created a guide to why boilers lose pressure, and the fixes here. When there’s no hot water but the heating works, this is usually a sign of a faulty diverter valve. However, it’s important not to jump to conclusions. We’ve had people contact us in the past with the same no water water/heating works problem. Their engineer fitted an expensive diverter valve, and it didn’t fix the problem. Here’s a guide to diagnosing a faulty diverter valve. Remember, don’t jump to conclusions. There are other reasons you could be getting heating but no hot water, such as faulty S-plan, Y-plan or zone valves. My advice would be to contact an engineer before spending any cash on repairs. If you’d prefer a replacement, you can get a price online here. When you get no hot water, but the cold water works, there’s a few potential problems. Those cover actual boiler faults. But, we’ve been to properties where it’s not the boiler’s fault at all. Have you smelt gas and turned off the gas valve? If this is the case, you’ll get cold water from the hot tap, but as there’s no fuel for the boiler to burn (and heat the water), you won’t get hot water. Did you try to increase the pressure of the boiler via the filling loop and close off more than one valve? In this scenario, the gas lever is probably still open and ready to fuel the boiler, but the water supply for the hot, has been turned off. You’ll want to check that both of these levers are open. If your property has no water coming from the taps at all (perhaps you just moved in), there’s a good chance the mains stopcock (sometimes there’s more than one) has been turned off. You’ll need to turn this back on to get a supply of water to the boiler, taps and shower. If the mixing valve is stuck or broken, it needs to be replaced or fixed. Personally, for the sake of what they cost, I’d get it replaced. On most newer showers you’ll have an anti-scalding device built in. If this is set too high, the water won’t heat up. It’s located behind the knob used to turn the heat of the shower up and down. Adjusting this can sometimes fix the problem. That said, it’s unlikely this has suddenly just changed (so, unless you’ve just moved in, we’d head for the mixing valve). Still need someone to come and fix your hot water? You can book one to take a look here. Prefer a replacement boiler? We’d recommend getting a price from BOXT’s boiler calculator. Whether you’ve got no hot water and heating, or just no hot water in your shower, we hope this has helped. If you’re still stuck, drop a comment below and we’ll get back to you as soon as possible.